Trying to get the balance between speed, consistency and accuracy. Surprising how it is very painful to perform the same dotting motion for an hour. 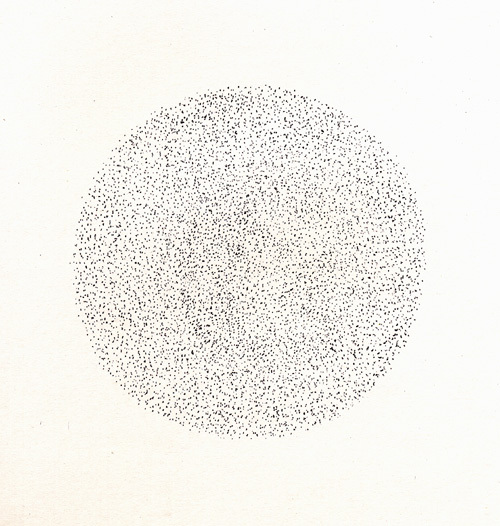 The circular disc is about 10.5cm in diameter, on 24x33cm paper. Fully Articulated comes from an interest firstly in the idea of "honest work" in art, secondly in testing hand, eye and brain, and thirdly in self-imposed constraints and limitations. More context for Fully Articulated here. Medium: black ink, 24x33cm, January 2003.